"When people think about how to solve hunger, we need to go deeper and think about the issues that are exacerbating the problem," said the report's lead author Mariana Chilton, Ph.D., MPH, a professor in the Dornsife School of Public Health and director of the Center for Hunger-Free Communities. "We see that if mothers experience at least one form of discrimination, they are more likely to face food insecurity when compared to those who did not experience discrimination. And this happens in most facets of life in Philadelphia—at work, in school, at the doctor." From 2015 to 2017 the researchers surveyed 669 caregivers (95 percent female) whose children are patients at St. Christopher's Hospital for Children in Philadelphia. The report, "From Disparities to Discrimination: Getting at the Roots of Food Insecurity," is part of Children's HealthWatch, a multi-site child health surveillance study, coordinated in Philadelphia by the Center for Hunger-Free Communities. 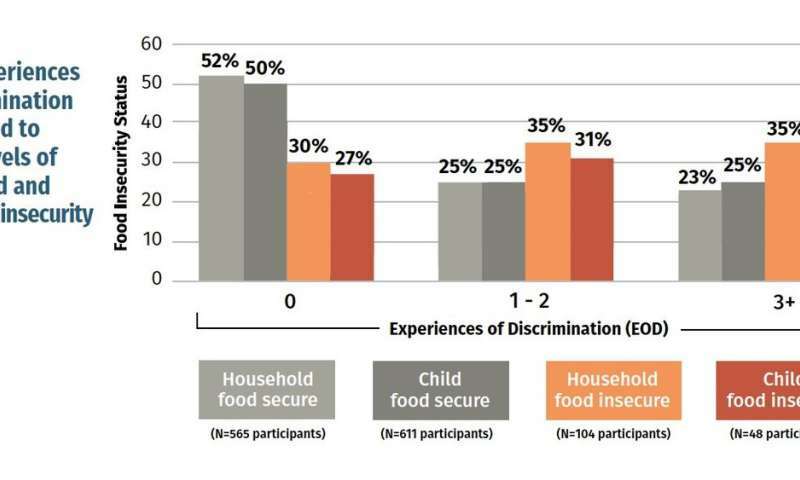 The researchers found that experiences of discrimination were strongly associated with household and child food insecurity. If the caregiver reported any number of experiences of discrimination, they were more likely to report household food insecurity compared to those who did not experience any discrimination. Food insecurity was measured by the USDA 18-item Household Food Security Survey Module. For example, women who reported discrimination at school were 60 percent more likely to report household food insecurity compared to those who reported no experiences with discrimination (22.2 vs. 13.9 percent). Women who reported discrimination while applying for a job were 77 percent more likely to report household food insecurity compared to those who reported no discrimination experiences. Women who reported discrimination in the workplace, from police and in public settings, reported similar rates of food insecurity as those who reported discrimination during the employment search process. In Philadelphia, one in five people suffer from food insecurity. Chilton and her colleagues write that their findings can be used to help address and prevent future discrimination, and, in turn, reduce hunger in the city. The report offers several policy changes, including training teachers and health care workers, strengthening the Fair Housing Act of 1964, and implementing citywide fair workplace policies, such as paid family and sick leave. The report also calls for ending the criminalization of minor offenses, as well as eliminating "stop and frisk" tactics.